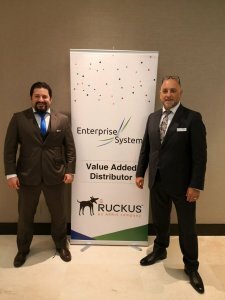 Enterprise Systems is awarded the Channel Training Distributor (CTD) in the region for Ruckus Networks, an ARRIS company. System Integrators are continuously looking for new brands as well as solutions to satisfy the needs of their end users, training will be the focus for creating a sound foundation for their pre-sales, sales and post-sales team to offer solutions from existing or new brands with comfort and confidence. Enterprise Systems, a value-added distributor dedicated to enabling our channel partners with networking, convergence, mobility and security solutions for their enterprise clients across the MEA, has been awarded as the Channel Training Distributor for Ruckus Networks, an ARRIS company. Ruckus Networks, an ARRIS company enables organizations of all sizes to deliver great connectivity experiences and delivers secure access networks to delight users while easing the IT burden, affordably. Organizations turn to Ruckus to make their networks simpler to manage and to better meet their user’s expectations. As the Channel Training Distributor of Ruckus Networks, an ARRIS company, Enterprise Systems can support our partners technical and commercial team get the skills they need to scale their capabilities to secure profitable business and manage their clients in the constantly changing and evolving market. Learn the capabilities of Ruckus wireless and wired networks through practical knowledge from the experts at Enterprise Systems, with best-in-industry training at your team’s pace and convenience to apply valuable knowledge in your environment. The training will motivate the partners technical and sales team members to confidently offer the Ruckus solutions to their customers knowing they can support and maintain with ease and assurance. This will create a strong foundation for growth and create value at their end user as the technology and strength of the product hand-in-hand with the acquired expertise of the partner creates a winning concoction. Enterprise Systems is focused to enable our partners with the unique training programs available to deliver a focused, and flexible curriculum tailor made to suit the partners technical and commercial capability with hands on sessions and project simulation to help drive our partners team members towards certification and enablement. Programs are available by area of focus and for different skill levels. Enterprise Systems offers exciting incentive programs tailored to our partner’s needs. Our incentive programs are designed to motivate the sales, pre-sales and post-sales team members in-order to secure and deliver the Ruckus Networks solutions. Enterprise Systems has trained over 100 partners from SMEs to large organizations, and offers customized & tailored enablement programs, certification Programs and workshops. Enterprise Systems team consists of high quality instructors with high partner & vendor satisfaction score. Our tutors have over 15 years of experience working with networks & partners and our tutors can bring hands on experience to our partners. Our Training Centre is equipped with the state of the art technology for hands on experience and we offer onsite, offsite and virtual training to fit with the complex and busy schedule of our partners.